Business Analyst plays a vital role in IT Project successful implementation. Business Analyst understands the Business process and identifies the areas of improvement or problem Areas and will suggest a suitable IT Solution for the GAP identified. BA will elicit the requirements from the concerning stakeholders and then does the analysis and confirms the requirements. BA will track the requirements during development and in testing phase, makes sure that UAT conducted successfully and sign off on the project closure document is done. Many Professionals aspire to get into Business Analyst role and many professionals are playing the role of BA without having BA designation. 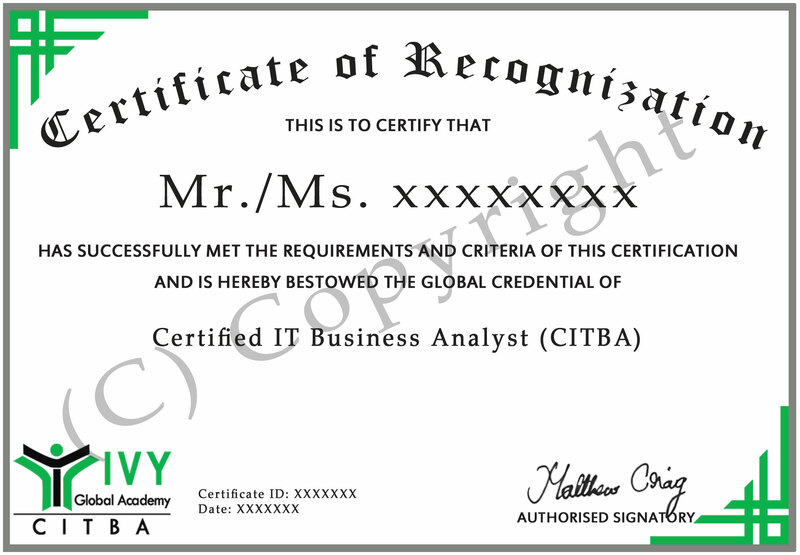 For all these professionals, the best option is get certified as CITBA to get formal recognition as BA . All entry level professionals looking for entry into BA role or Professionals practicing BA without being designated as BA can take this Certification to formally get recognized.